Perhaps the most colourful member of the Morgan family was Evan Morgan, 2nd Viscount Tredegar. The last member of the line to live at Tredegar House, Evan lived a life of great eccentricity and adventure. His week-end house parties at Tredegar in the 1930s and 40s gained much local notoriety. Surrounded by a menagerie of pets (including a bear named 'Alice', an anteater, and the talented 'Somerset', a boxing kangaroo) Evan, often with his 'familiar', a mischievous macaw named 'Blue Boy' (see above) perched imperiously on one shoulder, entertained on a lavish scale. 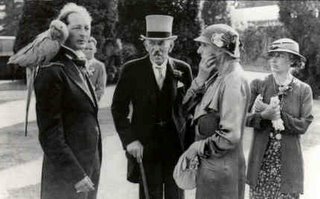 Among the many artistic, literary and society figures that enjoyed his princely hospitality at Tredegar House were HG Wells, Aldous Huxley, Augustus John, Nancy Cunard, Ivor Novello and the 'Great Beast' himself, the occultist Aleister Crowley. I am giving an illustrated talk on Evan's life at 10:45am on Saturday 25 February, at the Reardon Smith Theatre in Cardiff for the Friends of the National Museum and Galleries of Wales. All guests are welcome and can pay on the door (tickets £5), so if you are interested in learning more about the life of one of South Wales' greatest eccentrics, please come along. Didn't his mother build bird's nests? Remember an ad campaign on Newport buses a while back. Odd family! Yes, there was an ad campaign a couple of years ago involving Evan's mother, Katherine, Lady Tredegar: an image of her (taken from the Augustus John portrait at Tredegar House) accompanied the question: "Have you heard the one about the bird woman of Tredegar House?" Not a very subtle campaign admittedly. Yes, she did build nests, and they really were extraordinary. What kind of records exist for the servants below stairs at Tredegar house during Evan's reign? Do you know if there was a housekeeper? Would be grateful if you could get in touch Paul, many thanks. I'm writing a book on housekeepers of country houses, and Tredegar looks such an extraordinary place to have worked.